Since I had to use the R package smacof, yet the rest of my code usually is in python, I thought the fastest thing to do would be wrap smacof in python. Using the rpy2 lib, you can do this in quite a straightforward manner for any piece of R you’d like to use in python. The data exchange between numpy and R is also nicely taken care of. 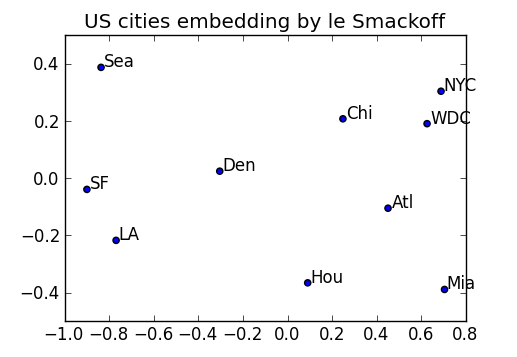 Here is the standard US cities distances example in R/python/smackoff. Edit: Seems like metric and nonmetric MDS are in queue for the next release of the machine learning library scikit-learn.